Prince Hamlet is the title role and protagonist of William Shakespeare's c. 1600 tragedy Hamlet. He is the Prince of Denmark, nephew to the usurping Claudius, and son of King Hamlet, the previous King of Denmark. At the beginning of the play, he struggles with whether, and how, to avenge the murder of his father, and struggles with his own sanity along the way. By the end of the tragedy, Hamlet has caused the deaths of Polonius, Laertes, Claudius, and two acquaintances of his from the University of Wittenberg Rosencrantz and Guildenstern. He is also indirectly involved in the deaths of his love Ophelia (drowning) and of his mother Gertrude (poisoned by Claudius by mistake). The play opens with Hamlet deeply depressed over the recent death of his father, King Hamlet, and his uncle Claudius' ascension to the throne and hasty marriage to Hamlet's mother Gertrude. One night, his father's ghost appears to him and tells him that Claudius murdered him in order to usurp the throne, and commands his son to avenge his death. Claudius sends for two of Hamlet's friends from Wittenberg, to find out what is causing Hamlet so much pain. Claudius and his advisor Polonius persuade Ophelia—Polonius' daughter and Hamlet's love interest—to speak with Hamlet while they secretly listen. Hamlet enters, contemplating suicide ("To be, or not to be"). Ophelia greets him, and offers to return his remembrances, upon which Hamlet questions her honesty and tells her to "get thee to a nunnery." Perhaps the most straightforward view sees Hamlet as seeking truth in order to be certain that he is justified in carrying out the revenge called for by a ghost that claims to be the spirit of his father. The 1948 movie with Laurence Olivier in the title role is introduced by a voiceover: "This is the tragedy of a man who could not make up his mind." T. S. Eliot offers a similar view of Hamlet's character in his critical essay, "Hamlet and His Problems" (The Sacred Wood: Essays on Poetry and Criticism). He states, "We find Shakespeare's 'Hamlet' not in the action, not in any quotations that we might select, so much as in an unmistakable tone...". Hamlet reclines next to Ophelia in Edwin Austin Abbey's The Play Scene in Hamlet. The name Hamlet occurs in the form Amleth in a 13th-century book of Danish History written by Saxo Grammaticus, popularised by François de Belleforest as L'histoire tragique d'Hamlet, and appearing in the English translation as "Hamblet". The story of Amleth is assumed to originate in Old Norse or Icelandic poetry from several centuries earlier. Saxo has it as Amlethus, the Latin form of the old Jutish Amlethæ. In terms of etymology the Old Icelandic name Amlóði comes from the Icelandic noun Amlooi, meaning ‘fool,’ suggestive of the way that Hamlet acts in the play. Later these names were incorporated into Irish dialect as Amlodhe. As phonetic laws took their course the name’s spelling changed eventually leaving it as Amlaidhe. This Irish name was given to a hero in a common folk story. The root of this name is ‘furious, raging, wild’. It has also been suggested that Hamlet's hesitations may also be rooted in the religious beliefs of Shakespeare's time. The Protestant Reformation had generated debate about the existence of purgatory (where King Hamlet claims he currently resides). The concept of purgatory is a Catholic one, and was frowned on in Protestant England. Hamlet says that he will not kill his uncle because death would send him straight to heaven, while his father (having died without foreknowledge of his death) is in purgatory doing penance for his sins. Hamlet's opportunity to kill his uncle comes just after the uncle has supposedly made his peace with God. Hamlet says that he would much rather take a stab at the murderer while he is frolicking in the "incestuous sheets", or gambling and drinking, so he could be sure of his going straight to hell. Harold Bloom did a "Shakespearean Criticism" of Freud's work in response. Gertrude has a similar tendency to interpret all of her son’s activities as the result of her "o’erhasty marriage" alone. Rosencrantz and Guildenstern tend to find the stalled ambitions of a courtier in their former schoolmate’s behaviour, whereas Claudius seems to be concerned with Hamlet’s motivation only so far as it reveals the degree to which his nephew is a potential threat. Ophelia, like her father, waits in vain for Hamlet to give her signs of affection, and Horatio would have little reason to think that Hamlet was concerned with anything more pressing than the commandment of the ghost. And the First Gravedigger seems to think that Prince Hamlet, like that "whoreson mad fellow" Yorick, is simply insane without any need for explanation. Several critics, including Stephen Booth and William Empson have further investigated the analogous relationship between Hamlet, the play, and its audience. This view of Hamlet's age is supported by the fact that Richard Burbage, the actor who originally played the role, was thirty-two at the time of the play's premiere. Barry Sullivan's burial site in Glasnevin Cemetery, Dublin, with a statue of Sullivan in character as Hamlet. Richard Burbage is assumed to have originated the role of Hamlet at the Globe Theatre. David Garrick made the role one of the centerpieces of his repertory in the 18th century. Master Betty played the role at the height of his popularity in 1805, and the House of Commons once adjourned early so that members of Parliament could see him play it. Edwin Booth was famous for the role in New York City in the 1860s and 1870s. 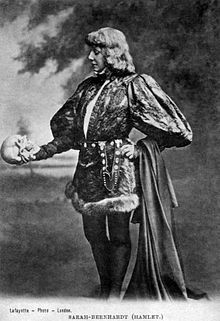 Sir Henry Irving, the first actor to be knighted, played Hamlet for an unprecedented 200 consecutive performances at the Lyceum Theatre in London in 1874. Mrs Powell was the first woman to appear in the role in London in 1796. Barry Sullivan played the role in the Victorian era; he was depicted in character in a statue on his grave. Johnston Forbes-Robertson played the role in 1898. John Barrymore created a sensation with his performance on Broadway in 1922 and again when he took it to London in 1925. John Gielgud played Hamlet over 500 times between 1930 and 1945. Gustav Gründgens played Hamlet in the Staatliches Schauspielhaus in Berlin in 1936. 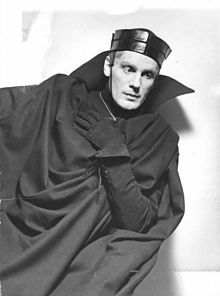 Laurence Olivier first played Hamlet at the Old Vic in 1937, later performing the production at Elsinore Castle. Maurice Evans first played the part at the Old Vic Theatre in 1935 and had a triumph on Broadway in 1938 and 1945. Paul Scofield played Hamlet at the Royal Shakespeare Company in 1948 and again in 1955, directed by Peter Brook. Richard Burton first played the role at the Old Vic Theatre in 1953 and returned to it in a 1964 Broadway production that became notorious when he married Elizabeth Taylor during its out-of-town tryout. David Warner starred in Peter Hall's Hamlet in the RSC's August 1965 production at Stratford-Upon-Avon. Richard Chamberlain was the first American actor to play the role in London since John Barrymore. This occurred in the late 1960s, immediately after the run of Dr. Kildare, the TV-series in which Chamberlain first made his name, ended. Vladimir Vysotsky played Hamlet in Moscow's Taganka Theatre between 1971 and 1980. Derek Jacobi played the role for the Prospect Theatre Company in 1977. Christopher Walken played the role for the American Shakespeare Theatre in 1982. Mark Rylance played the role for the Royal Shakespeare Company in 1988 and for Shakespeare's Globe in 2000. Ralph Fiennes won the Best Actor Tony Award in 1995 for his portrayal. Samuel West played Hamlet for the Royal Shakespeare Company in 2001-2 and won the Critic's Circle Award. Christopher Eccleston played the role for the West Yorkshire Playhouse in 2002. Toby Stephens played the role for the Royal Shakespeare Company in 2004. Ben Whishaw played the role for the old Vic in 2004. Michael Stuhlbarg played the role for The Public Theater in 2008. David Tennant played the role for the Royal Shakespeare Company in 2008-9. Christian Camargo played the role for the Theatre for a New Audience in 2009, for which he won an Obie Award. Jude Law played the role for the Donmar West End and later on Broadway. Michael Brando (grandson of Marlon Brando) played the role for a special TED event in 2010; he had played the role previously in 2008-9. Michael Sheen played the role at the Young Vic in 2011-12. Gustaf Skarsgård played Hamlet in Stockholm City Theatre's Hamlet in 2010. Maxine Peake played Hamlet at the Royal Exchange, Manchester in 2014. Benedict Cumberbatch played Hamlet at the Barbican Centre in London in 2015. Paapa Essiedu plays the role for the Royal Shakespeare Company in 2016. Christian Friedel plays Hamlet for the Staatsschauspiel Dresden since 2012. Anthony Currie and Jack Orrico played the role for the South Carolina Governor's School for the Arts & Humanities in 2016. Oscar Isaac played Hamlet at The Public Theater in 2017. Ruth Negga played Hamlet during the 2018 Dublin Theatre Festival. Johnston Forbes-Robertson immortalized scenes from his performance in a highly truncated silent film made in 1913. Danish actress Asta Nielsen portrayed Hamlet in a loose 1921 adaptation which re-imagines Hamlet as a woman. Laurence Olivier directed himself as Hamlet in a 1948 film. Richard Burton portrayed Hamlet in a 1964 filmed version of the stage play. Innokenty Smoktunovsky played Hamlet in a 1964 Russian film, directed by Grigori Kozintsev. Nicol Williamson portrayed Hamlet in Tony Richardson's 1969 version. Mel Gibson played Hamlet in Franco Zeffirelli's 1990 version. Iain Glen portrayed Hamlet in the 1990 film Rosencrantz & Guildenstern Are Dead, directed by Tom Stoppard and based on his play. Kenneth Branagh directed himself as Hamlet in a 1996 film version, which is the only full length version of the play on film. Ethan Hawke played Hamlet in an adaptation released in 2000. Richard Pyros played Hamlet in Hamlet released in 2007 at the Melbourne International Film Festival. Shahid Kapoor played Haider (Hamlet) in a 2014 film adaptation by Vishal Bharadwaj. Maurice Evans was the first to play the role on American television, in 1953 on the Hallmark Hall of Fame. Christopher Plummer received an Emmy Award nomination for a television version filmed at Elsinore Castle in 1964. Richard Chamberlain played Hamlet in a Hallmark Hall of Fame presentation in 1970. Derek Jacobi played Hamlet in the 1980 BBC Television Shakespeare production. Kevin Kline played the role in a 1990 PBS television production which he also directed, and which originated at the New York Shakespeare Festival. Campbell Scott played the role in a U.S. 2000 television production set during the American Civil War, in which Polonius, Ophelia, and Laertes were portrayed as an African-American family. David Tennant and the rest of the original cast from the 2008-9 Royal Shakespeare Company production reprised their roles for a BBC film version, which aired in the UK in December 2009. In the comic book series Kill Shakespeare, Hamlet is the central character. After he is exiled from Denmark, his ship is attacked and he washes up on England. He is encountered by Richard III of England, who tells him that he is the "Shadow King", a figure of prophecy. He tells Hamlet that he must find and kill the wizard William Shakespeare and retrieve his quill. He goes off, but is relentlessly pursued by assassins from Richard and his lieutenant, Iago. He is eventually captured by the fool known as Falstaff, who helps him get out of the woods after an encounter with a being known as a Prodigal. He is shot in the leg by Iago, but is saved by Juliet Capulet and Othello. Hamlet stops Othello from killing Iago, but is taken captive by Juliet and her resistance army. After going with them into a town and seeing the cruelty of Richard, Hamlet flees into the woods, where he is forced to face the ghost of his father. He defeats the ghost and is eventually picked up by two travellers: Lysander and Demetrius. ^ Howard, Tony (2007). Women as Hamlet : performance and interpretation in theatre, film and literature (1. publ. ed.). Cambridge [u.a. ]: Cambridge Univ. Press. p. 39. ISBN 0521864666.